The Queensland Reds represent Queensland in the sport of rugby union in the Southern Hemisphere SupeRugby competition. Prior to 1996 they were a representative team selected on merit from the rugby union club competitions in Queensland. With the introduction of the professional Super 12 competition they moved to a model where players are contracted to the Reds through the Queensland Rugby Union rather than selected on the basis of club form. From 1996 to 2005 they were one of three Australian teams competing in the Super 12 competition, alongside the New South Wales Waratahs and the ACT Brumbies. Queensland finished as minor premiers in 1996 and 1999, but they have never reached the Super 12 final. From 2006 to 2010, they competed in the expanded Super 14 competition as one of four Australian sides. Beginning in 2011, they will be one of five Australian sides in the expanded and renamed Super Rugby. The teams' home strip is a red jumper with a white collar, navy shorts with red socks with white hoops. The jersey is manufactured by KooGa, and the primary shirt sponsor is Queensland Rail (QR). Traditionally, the Reds Super Rugby logo as well as the traditional Q logo both appear on the jersey, however for 2007 a commemorative shield was worn instead, which incorporated the QRU's four logos over the past 100 years. The Super Rugby logo and sponsors Tooheys New appear on the sleeves. The alternative jersey is similar, except that it is predominantly white. 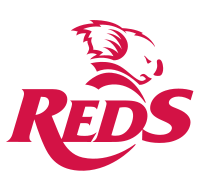 The Reds' logo is a Koala, a native Australian animal, with Reds written underneath it. Prior to 1895 the Queensland team wore a variety of jerseys until the red/maroon colour became the Queensland jersey. In 2007, the Reds used a commemorative jersey in celebration of 125 years of Queensland rugby. This was accompanied by a new logo featuring four Queensland crests from the past.